Sometimes, I don’t have interesting stories for why I chose a particular recipe on a given week. This is one of those weeks. Casting about for something to cook for new-recipe day, I checked NPR’s food blog (sadly no longer active) and found a week devoted to roasted tomatoes. Now, I’ve never roasted tomatoes, but the recipe seemed straight-forward enough, and I love tomatoes so, decision made. Warning: this recipe takes a long time to put together, like 2 hours so make sure you leave plenty of time to make it. Or have lots of little snacks to munch on while cooking. Or wine. Or both. Slice the tomatoes and stick them on a lined baking sheet. Drizzle the vinegar, oil and a little salt over the slices. Stick in the oven and roast at 350 until they start to brown and dry out. I prefer them only lightly roasted, but you can roast them longer if you want. Just an fyi, the tomatoes will start by expelling the juice, so there will initially be more juice in the pan, before it starts to evaporate – so don’t worry if 10-20 minutes in the bottom of your pan has a lot of liquid on it. Mix together the flour and cheese in a bowl. Cut in the butter with a pastry cutter (or a fork if you don’t have one) until it is all incorporated, and the dough can almost clump together. Add the water, a little at a time, stirring it in with a knife and your hands until a nice dough has formed. Cover with plastic wrap and stick it in the fridge. Heat the olive oil on a large frying pan, and turn the heat down to low. Add the onions and stir so they are all lightly coated in the oil. Cook on low for about 20 minutes, stirring occasionally. The onions should be translucent but not brown. Add a little white wine to the pan, and keep cooking, on low, stirring every few minutes. The onions should shrink and slowly begin to color. After about 20-30 more minutes, the onions should begin to brown. At this point, you can either be done, or keep cooking until they become a nice amber-brown. The longer you cook them, the sweeter they get so it’s really up to you. I prefer them on the more lightly-sweet side. Roll out the dough into a large circle and line either a pie plate or a tart pan. I had some leftover dough, so don’t worry if you do too. Put the onions as the bottom layer. Add some nice cheese over the onions. I used goat cheese and this spanish sheep cheese, but feta would work well – as would most slightly strong cheeses. Mozzarella might be too mild for this one. 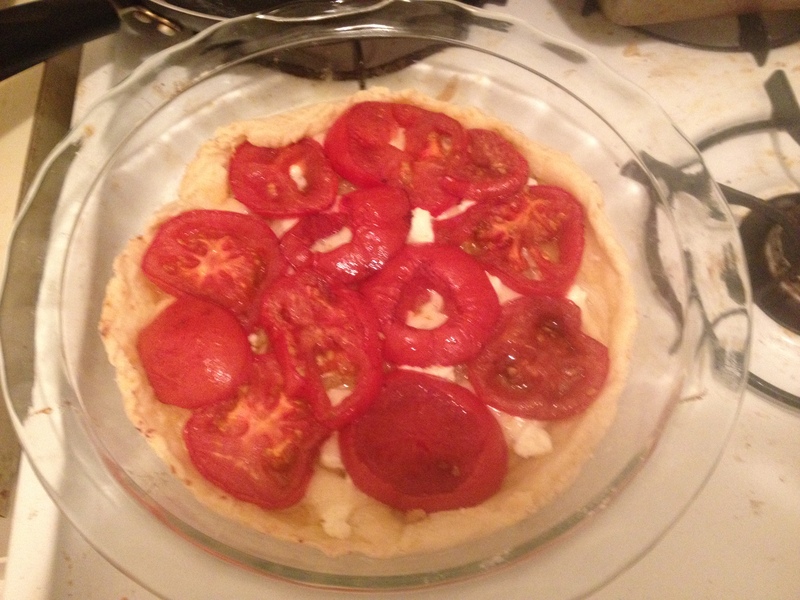 Layer the tomatoes on top of the cheese, and bake for 20-30 minute at 350 until done. The result: unbelievably good. Like ridiculously good. Whether its good enough to be worth the amount of time it takes to make is more up to you, but it is pretty freaking delicious. And if you want an evening-long cooking project its great. It also stays good the next day, and is really good cold, which is nice because then you don’t get the limp crust problem than happens when you reheat something like this. Serve with a white wine, the one you used to cook the onions in preferable. But its a nice, versatile recipe, so it’s will pair well with most things. Song of the week: You’ll be in my heart, by Phil Collins – for no better reason than I’ve been feeling nostalgic and sometimes I’m a big softy. Last weekend was the final of what is one of the biggest sporting events in the world: the World Cup. I’m not a huge soccer fan per se, but I enjoy watching sports as a general rule, so I watched a number of games. For this week, I thought it’d be appropriate and fun to make a dish from the winning team’s traditional cuisine. Germany won, which put me in a slightly awkward position – German food isn’t exactly known for being vegetarian friendly. However, that has never daunted me before so it obviously wouldn’t do so now. 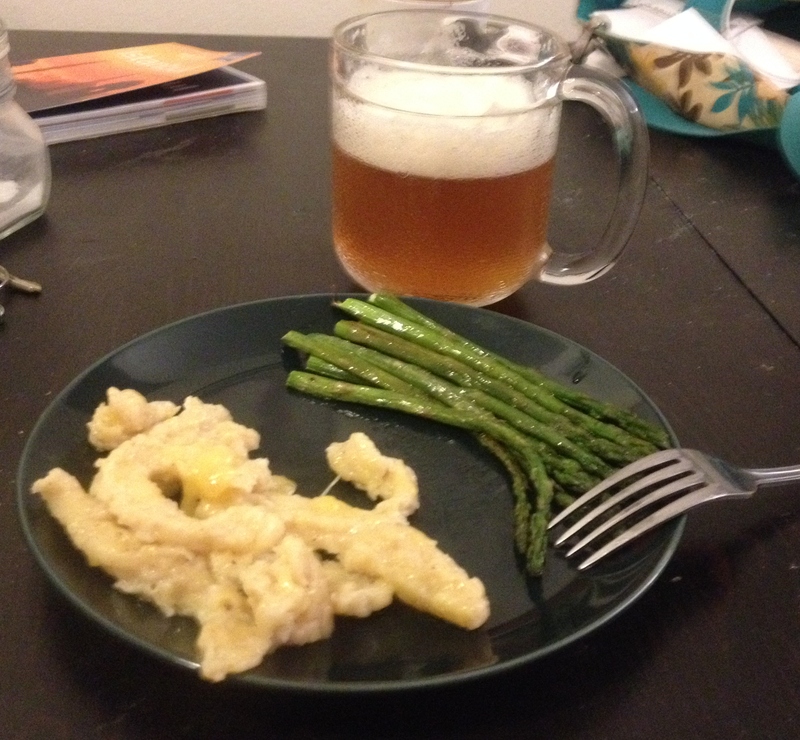 I decided on spaetzle, which I understood to be a German sort-of pasta, and roasted asparagus, because internet research suggested to me that asparagus was a common enough German vegetable (ok, it said white asparagus was considered delicacy in the past, but close enough). Beat the egg and mix all the ingredients together. Add enough flour that the dough isn’t all sticky, but somewhat handle-able. Simple yes? Well, after this is where I got into trouble. The recipe I was using as a template said you could squash the dough through a metal cheese grater to shape it. Maybe other people can, but I definitely couldn’t. So, my logical idea was to simply cut the dough into long strips with a knife. I had varying success as the dough was still pretty sticky. Once the dough was is pieces of varying size and thickness, I stuck it into a pot of salted boiling water. Boil the giant spaetzle until they begin floating, then take them out and saute for several minutes in a tablespoon or 2 of butter. Once nice and buttery, stick them in a bowl, and toss with grated cheese. I used an Austrian cheese called Amadeus, because Whole Foods didn’t have any German cheeses. Let the cheese melt onto the spaetzle and serve warm. Spaetzle aren’t supposed to be that big …. So, the resulting dish was delicious. Cheesy, buttery, carb-y goodness. With some excellent asparagus on the side (toss with olive oil, salt, pepper, and roast at 400 until tender) it was an awesome meal. But I’m not totally sure if it actually qualifies as spaetzle, which is supposed to be much smaller. My sister declared them giant spaetzle though, and that seemed appropriate enough for me. Naturally, one should pair this with a nice beer. I actually had a Belgian-style farmhouse ale because I didn’t see any German beers I wanted at the store. But if you want a German beer, I think a solid Hefeweizen would probably pair best. Song of the week: Down on the Corner by Creedence Clearwater Revival. This is just such a great feel-good rock song, and CCR are vastly under-appreciated. Also, fun fact, CCR is not from the south, they are from California – in fact, they come from the same area I grew up in. East Bay for the win! And, even one of their more country songs, Lodi, is about rural NorCal. I am a stress baker – when life gets difficult one of my main coping mechanisms is to bake things with lots of sugar and probably chocolate. However, I do try to be a healthy person, for the most part. This week, when the urge to stress-bake occurred, I remembered I had a zucchini nearing the “use it or lose it” phase of life. 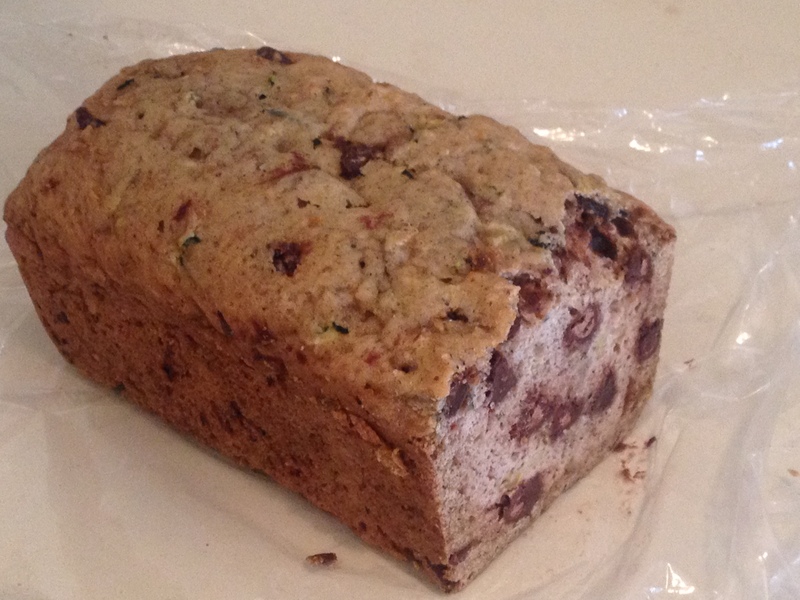 Internet-land helpfully reminded me that zucchini can be used in desserts, and I knew what I was going to bake – chocolate-chip zucchini bread. This is my base recipe, but I modified it for myself a bit. Cream the butter and sugar together. I always use salted butter because a, it tastes better, and b, most recipes that call for unsalted butter have you adding salt anyways, and that just seems inefficient and silly. Beat in the egg and vanilla. Then add all the other ingredients (except the chips) and beat them all together with a hand mixer. Zucchini is super easy and fast to grate with a cheese grater so no worries if you don’t have a food processor (like me). Stir in the chocolate chips last (to taste). Pour batter into a greased loaf pan (or 2 mini loaf pans) and bake at 350 until done – aka golden brown on top, amazing smell, and springs back when you touch it. Cool on a wire rack once its done. The result: awesome – even better than I expected. The cinnamon and nutmeg I think are the true key to this recipe. I admit – I was skeptical about this one, but I shouldn’t have been. The best I can describe it is that it tastes like oatmeal-chocolate chip cookies in bread form. You really don’t notice the zucchini either, although you know it’s there. So you can snack on it without feeling guilty – although, disclaimer, I don’t think this recipe is actually healthy in any way. So don’t feel guilty (one should never feel guilty about eating good food regardless) but don’t lie to yourself either. Finally, the song of the week: Woman of Faith by Eddie from Ohio. I find this song extremely soothing, and listened to it on repeat for awhile this week. Not quite as long as my 2 hour Sweet Child O’ Mine repeat marathon, but a solid runner up. As much as I enjoy teaching myself new things, sometimes, the best way to learn how to make something new, particularly a new type of cuisine, is to take a cooking class. 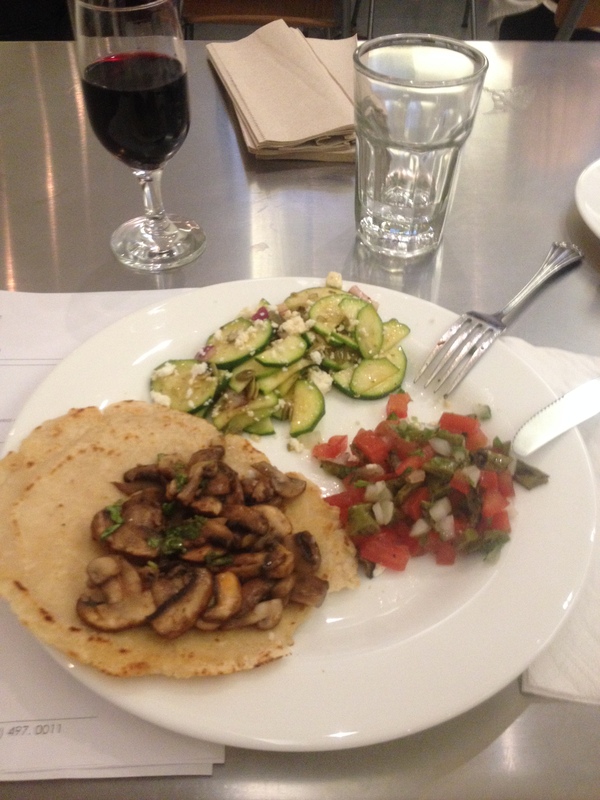 It is unsurprisingly difficult to find vegetarian cooking classes (although many are willing to accommodate vegetarians) but I did manage to find an awesome one – a vegetarian Mexican cooking class. We ending up in groups of 4, and each group of us made 5 dishes total. I’m not going to go through all five recipes (sorry) but I will go through two of them – the cactus salad and the chocolate flan cake. Prepare the cactus paddles by cutting off the bottom bit, the edges, and scraping off the thorns (basically a similar action to peeling a carrot with a knife instead of a peeler). Once the cactus has been cleaned, slit the cactus pad a few times and then grill it for 10 minutes, five on each side. If you can’t grill it than baking would probably work, but I make no promises since I haven’t tried it. Chop the onion, tomato, cilantro, and cactus (once its done cooking) and toss with some salt, pepper, and lime juice. And done. First, you make the flan. Take 4 eggs, 1 egg yolk, 2 1/2 cups of milk, and 1 tsp of vanilla and blend it all together in a blender. Then you make the cake batter. Cream together 6 ounces of butter and 1 cup of sugar, then beat in two eggs and 1 tablespoon of vanilla. To the wet ingredients, add 1 1/2 cups flour, 1/3 cup cocoa, a pinch salt, 1 tablespoon baking powder, and 1/2 cup sour cream. Blend all the ingredients together until smooth. Heat some sugar in a saucepan until it has lightly caramelized – do not overcook it. Add the caramelized sugar to the bottom of a circular cake pan. Pour the flan mixture on top of the sugar. Then pour the cake batter over the flan (yes it sounds insane, I know), distributing it as evenly as possible. Tightly cover the cake pan with aluminum foil and bake in a bain-marie by putting it into a larger oven-proof pan filled half way with boiling water (it should cover the cake pan half way too.) Carefully place in the oven and bake for about an hour. 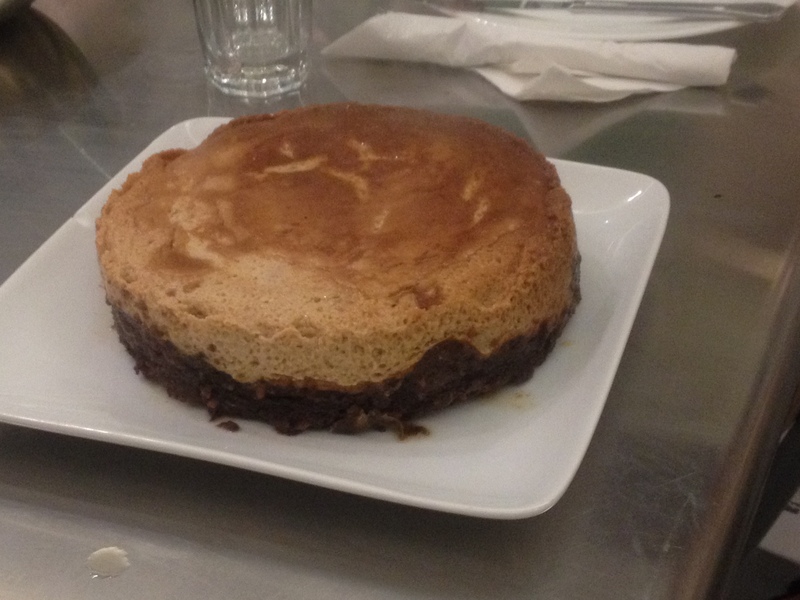 Then, let the cake cool for another hour, before inverting it on a serving dish (so the flan is on top) and serve. The Nopales salad was yummy, and struck me as a perfect Mexican dish, as its the colors of Mexico’s flag. The only down side is that is doesn’t keep very well – after a while the cactus starts oozing goo – so eat it fresh. The cake was freaking amazing though. Good warm, good cold the next day, just addictively good. And the basic template probably has endless variations, if you want something similar but different. All in all, the meal was delicious, and the class was a ton of fun – definitely a good way to spend an evening. The song of the week is the Sam Tsui version of Pompeii – I’m not quite sure what it is about this song that makes me like it so much, but there you go.